Are you a mad snacker? Are you a mad snacker? Because I am. Nothing makes my late afternoon days fly by like a little pick-me-up from the Chocolate Fairy. Some people reach for an apple, maybe some nuts. Some like the salty, some like the sweet. I’ll take the sweet and I am not afraid to admit it. For me it’s a tie between the Hot Tamales and the See’s Candy. It’s no secret that between meal snacks and beverages high in sugar and starch can promote tooth decay. Yet, as a self admitted mad snacker I cannot condemn my fellow cohorts. As a dentist, I feel a bit compelled to let you in on my secret. 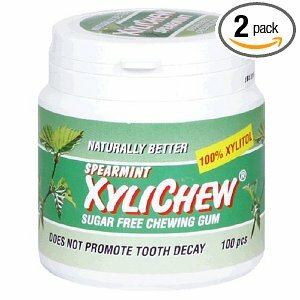 Xylitol gum. Not only does it have fewer calories and less effect on blood sugar than sucrose, but xylitol gum has the added benefit of inhibiting the creation of acid in the mouth. Products sweetened with xylitol create an unwelcome environment for bacteria; they simply cannot stick to teeth in a xylitol-rich environment. This minimizes the damage done to your teeth, as well as allowing your teeth to heal at a faster rate. It allows the teeth to re-mineralize the calcium ions in enamel before dental caries form. So what’s that all mean? Chew a piece of xylitol gum after every meal or snack for maximum benefit to your teeth as it may reduce the risk of tooth decay and snack on! I like the Spearmint Spry, but it comes in other flavors like cinnamon, peppermint, fruit and even green tea. New Leaf, Staff of Life and Whole Foods all have a version of it, so pick up a pack next time you are in. 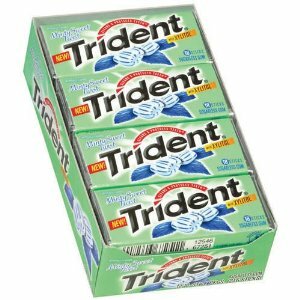 They are also putting xylitol in some Tridents now!